SMOKEmUP.com :: View topic - Exhaust crossover tube?????? Posted: Wed Apr 23, 2008 11:42 pm Post subject: Exhaust crossover tube?????? Just got a 3" exhaust system for my 70 Elcamino and want opinion on weather a crossover tube is worth anything. Just to recap it is a 496 with a forged rotating assembly, GM square port open chamber heads 10 to 1 compression. I wanted it looking stock so I ported the stock exhaust manifolds and it has a gm aluminum low rise intake with a 2" spacer. Carb is a 750 Holley by Berry Grant that supposedly flows 1040 cfm. Cam is a hyd. roller 230 @ 050 int. 242 @ 050 ex. .610 lift. 114 LSA I have 4 valve cover gaskets glued and stacked under the stock valve covers to clear the rockers LOL. Anyway my 3" Summit exhaust kit showed up today and I am wondering if you guys think adding a crossover is a waste or not. The exhaust that was on there was way to small so this should help alot I hope. I agree with Clay the cross over improves total volume available to the engine as far as exhaust pressure, and the cross over if an "X" allows for the exhausts pulses to be split which improves upon that anoying tinny resonance. 3" dual exhaust with stock manifolds? What's wrong with this picture? "It may be ugly, but it's SLOW"
If they were extrude honed I'd buy it. But just ported? I have done extensive tests with stock exhaust big blocks. There is not that big of a difference with a long stroke under 5500rpm. Placement of the muffler is the most critical. If you learn from your mistakes, then I must be a freaking genius! LOL cutless 389. Believe me I wanted to put headers on but it is a real ss454 car and I wanted it to look very clean and original. Tha biggest problem with the manifolds was they were smaller than the port so the exhaust would have been hitting a wall. 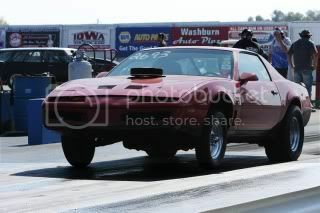 Thed car already runs hard but I think it has more in it with the exhaust changed. We spent an entire day with a mild BBC stock manifold 2.5" dual exhaust on the dyno. We started with the entire exhaust system right out of a 1/2 ton. Used three types of mufflers and open pipe. Test 1 all stock with tail pipes. Test 2 40 series flowmasters in place of stock mufflers, bottom end gain,mid range loss,top end loss. The next series of tests were placing the two types of mufflers a foot closer to the engine with and without tail pipe. All the results were very similar with slight gains getting closer to the engine. Removing the tail pipe always yielded slightly better. The best results was 44" from the rear exhaust port to the inlet of the muffler. The lowest power was open pipe(no muffler). The flowmasters were a little better throughout the rpm range and the stock mufflers were better than the flowmasters in the mid and top end only. The third muffler that was used was a 15" supertrapp 28 discs and closed end caps. Those mufflers had substantial gains in all the rpm ranges. I've tested flowmasters vs. supertrapps in other combos and the flowmasters typically have better bottomend numbers but always fail miserably in the mid and top end. I've talked to a flowmaster rep and asked him which was the best they had to offer. That was a total mistake! If you can detect a little vagueness in my writing, it is because each engine combo is different and the results are of course different. That is why I never tell actual horsepower numbers. I leave that up to the people who are trying to sell. Dynoes typically are acurrate to 1% and a "slight gain" only means you are headed in the right direction. The rpm range that was used 3000-5000. As the rpm range goes up, the exhaust system becomes exponentially more important. The information that I am giving is only my interpretation of the numbers that a dyno measured. The owner of the engine said "cool beans" and still used the flowmasters . So it looks like the Magnaflow strait through ovals with packing are going on next. I have used these before and they are quiet and you can see strait through them (no restriction). Something wrong with a screamin' big-block? You may be on the wrong forum. 3" duals=loud, what's the problem? I know my thinking is often suspect but-mufflers are too restrictive yet manifolds are marvelous? Flow, be it hydraulic-gaseous-electrical is subject to upstream/downstream physics. A sewer pipe downstream of a garden hose will flow like...a garden hose. As far as mufflers, I'm sold on the Dynomax race bullets. Straight through, but from idle to 1/2 throttle they are very mellow WITH TAILPIPES and positively evil with the loud pedal matted. Plus they fit in my dirtbag budget. 2 1/2 to 3" isnt exactly a garden hose into a sewer pipe, AND I LIKE SCREAMING BB ONLY quietly so I can floor it anytime and not attract every cop within 2 miles. I may break down eventually and put headers on it, but for now the experiment continues.